Christmas is a very special celebration in Spain and, as in every country, we also have our own traditions, although we’ve included other popular customs over the years. In Spain we love lottery, and Christmas is the best excuse to buy some, this tradition started the 22nd of December in 1812 and, for many Spanish people, that day of December is when the christmas officially starts. Every 22nd at 9:15 am, families gathers around the television where the national tv channel broadcast this special event. 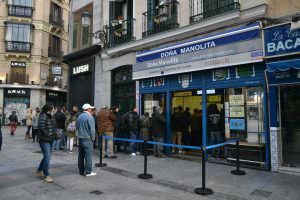 In Madrid, you can find Doña Manolita (Calle del Carmen, 22) the greatest lottery establishment in Spain. You’ll always find very long lines of people in queue, especially since October, who wants to buy this christmas lottery. Don’t expect this to be a huge building, it’s a very small establishment. We call the night of the 24th of December “Nochebuena” which means “Good Night” and during this, family and friends always gather to have a very big dinner together that usually begin with some starters, after that two main dishes, dessert and last but not least, some traditional Spanish Christmas sweets like “turrón”, “polvorones”, “mazapanes”, and “mantecados”, most of these made out of almond dough. After dinner, all the principal tv channels stop what they are broadcasting for the king’s speech. This night there are some families that decide they want to celebrate Santa Claus as an english influence. 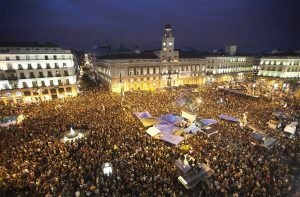 Over the years this tradition is more common in Spain. We call this night “Nochevieja” which means “Old Night” and, in this case, the most special tradition is to eat 12 grapes, one by one each second during the 12 last before 00:00 of the 1st of January. This tradition is called “Las 12 campanadas” (12 strikes) and it was established in 1909. We like to believe that if we eat all of the grapes, we’ll have good luck in the new year that is starting. Los Reyes Magos (the three kings) are the ones who bring us gifts instead of Santa Claus, and they do it during the night of the 5th of January. Everybody is very excited for that day, so during the day, every city celebrates the Cabalgata de los Reyes Magos, which is a procession where the three kings: Melchor, Gaspar and Baltasar greet and give sweets to all the children. After that the kids give their favorite king their wishlist letters where they explain how good they’ve been that year and what they’d like as a gift. 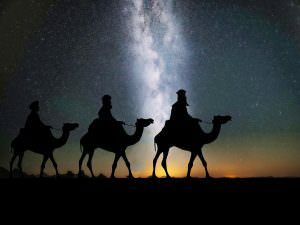 That night everyone has to go to sleep early in order to wake up ever earlier and see what the three kings have brought for the family. 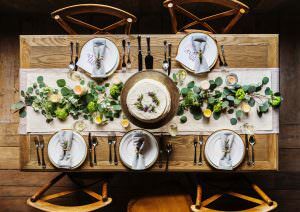 It’s a special day, so family and friends gather to celebrate and, as always, that means eating! You can not miss trying El Roscón de Reyes, the famous king cake, similar to a big bagel, which hides surprises inside, and each one of them means something. Merry Christmas and Happy New Year! Or how we say it: ¡Feliz Navidad y Próspero Año Nuevo!